Can You Eat Raw Lemongrass? Jessica Jacobs is a registered dietitian and professional writer, contributing to "Fitness Magazine" since 2003. She received a B.A. in journalism from Arizona State University and an M.S. in nutrition and food sciences from the University of Texas at Austin. Cymbopogon, or lemongrass, comprises more than 55 species of grass. You can use lemongrass in various dishes and teas, as a pesticide and as a preservative. You can also prepare lemongrass can in several ways and use this grass fresh, dried or powdered. You can eat raw lemon grass. However, whole lemongrass is not easily chewable, so remove the stalk before consuming raw lemongrass. Lemongrass has wide use in Asian cuisines. When eaten in its fresh, raw form lemongrass has a strong citrus flavor. The most common uses of lemongrass includes soups, teas and curries. Additionally, Asian cuisines commonly use lemongrass in the preparation of poultry, seafood, beef and fish. As a tea, lemongrass has common use in Togo, Latin American countries and the Democratic Republic of the Congo. Normally, chefs use this substance in small amounts as a flavor enhancer. 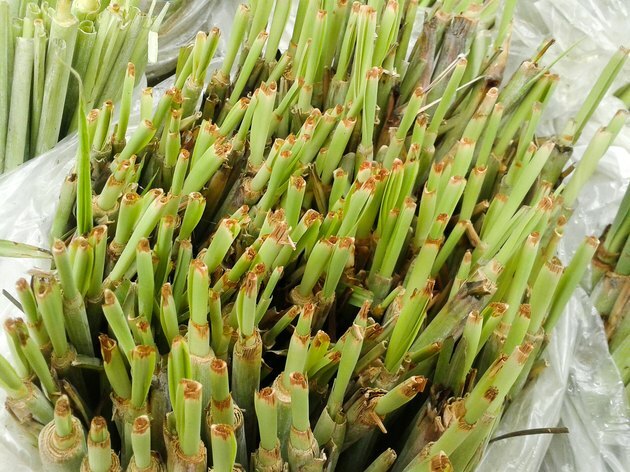 Before consuming raw lemongrass, peel off the outer layer of leaves from the stalk. Then, continue to cut the dry top of the stalk before rinsing off the bottom bulb. You can eat the whole lemongrass, including the stalk. However, the stalk itself is tough and hard to chew. For this reason, you may want to remove the stalk before consuming the raw lemongrass. According to Drugs.com lemongrass may have a number of healing properties. It may make your heart work more efficiently, help does not raise your blood sugar and acts as an antioxidant. Further, lemongrass acts as a stimulant of blood circulation and digestion. A study conducted by Ben Gurion University in Israel, and published in the May 2005 issue of "Planta Medica," found that lemongrass caused programmed cell death in some types of cancer cells. One cup, or 67 grams, of lemongrass contains approximately 17 grams of carbohydrate, 0.3 grams of fat and 1.2 grams of protein. Lemongrass also contains a variety of vitamins, including vitamins A, C, B-2, B-3, B-6 and folate. Additionally, lemongrass contains the minerals calcium, iron, magnesium, phosphorus, potassium, sodium, zinc, copper, manganese and selenium. One serving of lemongrass also contains approximately 68 calories, according to the USDA National Nutrient Database. What Are the Health Benefits of Lemongrass Tea? Can You Lose Weight With Lemongrass? What Are the Benefits of Turmeric Leaves?